This is how I'm feeling since finishing John Green's The Fault in Our Stars. I'm not a YA reader and I definitely steer away from tearjerker stories, so I am a little surprised at how affected I've felt since finishing the book. It was very, very good and I'll definitely try to get a review up in the next day or two. It's not a perfect 5-star read for me (I reserve 5-stars for my favorite, favorite books), but it came pretty close, I'll say. I just can't get Hazel and Augustus out of my head. 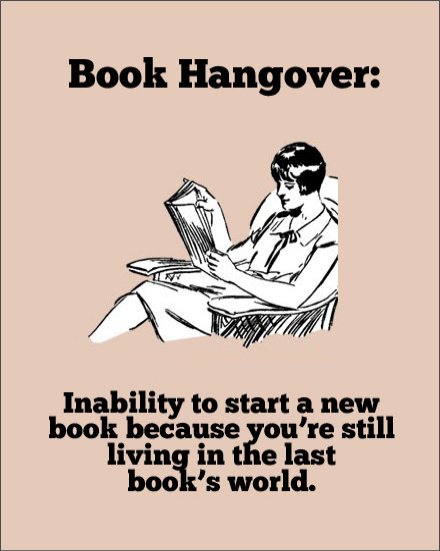 Do you ever feel like you have a book hangover? It's always especially weird if I finish a book in a public place, I think, and I feel like I've had this big moment while everyone around me is going about their lives. The power of books! I know the feeling! But I feel like I have so many books I want to read that I need to get started on the next one within a day. No time to waste! I know, I know! I'll get over it soon. I actually did begin another book last night, but I was so distracted, I couldn't get into it! I'll try again tonight. Seriously!? Ughh, this is just like The Hunger Games. First G, then you. You two are not allowed to recommend any more YA literature! haha. Guess you'll just have to read this one too, based on G and I's expertise at picking YA literature. It's a quick one! Not as good as The Hunger Games though.